What are they doing, filming a new season live in person? Maybe they're going to do a stage play version of season 3. Could be they want to remind people about the show for the Emmys that will be awarded about a bazillion years after it aired. So do we assume that this is what Kimmy Robertson was referring to in July? That should scotch the "imminent July announcement" rumours if so. baxter wrote: So do we assume that this is what Kimmy Robertson was referring to in July? "Somebody I know was recently in a car with his wife, and she was talking about how much he enjoyed it and why he wanted to do more if there was ever more. He had never experienced anything like it. 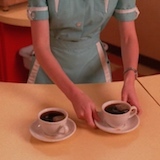 She didn't know that this person knew anything about Twin Peaks or anything, and she said that, 'He heard that...there would be sixteen cast members (one an executive producer) signing autographs at Comic-Con!'" Doesn't sound right to me. If there's anything to what Kimmy's saying, it's got to be something additional at the event or something else entirely. What do people think of an elaborate, communal fan shout-out towards L&F to sorta beg them for more.. as a fan base? We could be like COOP* in the old days. Maybe get some people together? Jerry? Pieter Dom? hell, maybe even obnoxious & anonymous , I guess we all want the same??? Jasper wrote: If there's anything to what Kimmy's saying, it's got to be something additional at the event or something else entirely. That was my first thought. That they are linked, but not that Kimmy was talking about an appearance at Comicon. I'd be shocked if anything new was announced so soon, but I do find it very curious they're all blanketing SDCC with no show out. TP is a longshot for major Emmys IMO. heheh- your post actually made me laugh out loud Jasper. You are probably right (and fingers crossed that you are). What it does at least show, of course, is that they are all in contact at the moment (at least with Sabrina Sutherland probably), which means that it is possible that they could hear things that they are not telling us. Sabrina being there also made me very curious. Soolsma wrote: What do people think of an elaborate, communal fan shout-out towards L&F to sorta beg them for more.. as a fan base? "It feels really good. It went really good in the world. I feel very thankful and happy that we did it." That said, what you suggested probably couldn't hurt. I just tend to think that it wouldn't sway Lynch or Frost either. We at least know that Showtime would do it, so it's probably entirely down to Lynch and Frost feeling like they've got something worthy. As per my knowledge, SDCC is after the Emmy nominations are announced, so maybe a good chance of a Season 4 tease? To me, this event at Comic Con seems more like an Emmy push. That being said... I can't think of a better Emmy push than announcing Season 4 during the voting period. I am shocked that it has taken this long (regardless of it was a "working on it" or "that's it forever" announcement). This reminds me of last year, when people were assuming some announcement was in the offing because the panel was in Hall H.
We know Showtime views the show as a very important part of its ongoing rebranding effort. Without more evidence, I don’t see this as anything more than a part of their push to keep the property alive in the public consciousness for as long as possible. And Kimmy’s quote has always struck me more as Kimmy being her rambling self than something to be taken as a portent. I’m still 50/50 that a new season will happen eventually (depending on the day I’ll even go to 60/40), but I refuse to get my hopes up, particularly this soon and with so little to go on. I appreciate the optimism, but low expectations have served me well in life. I’d rather be pleasantly surprised than disappointed.